Young people develop life-long skills with opportunities for water safety and recreation. The hottest way for kids to cool off this summer! Campers spend the full week enjoying an awesome array of water activities including canoeing, snorkeling, swimming and other water games and activities. Campers learn paddling skills and canoe/kayak safety as they experience the challenge of navigating water! Kids learn to identify the parts of the canoe/kayak, paddling techniques, the importance of teamwork. A daylong kayak excursion will test their skills and they’ll enjoy a fun cookout! Synchronized Swimming at its funnest! This camp is for the campers who love water, music, and being a little silly. Campers will spend each day swimming and working on a shallow-water synchronized routine to show to parents at the end of camp. Campers learn the fast-growing, life-long sport of Stand Up Paddleboarding. It’s a fun and easy way to play on the water. 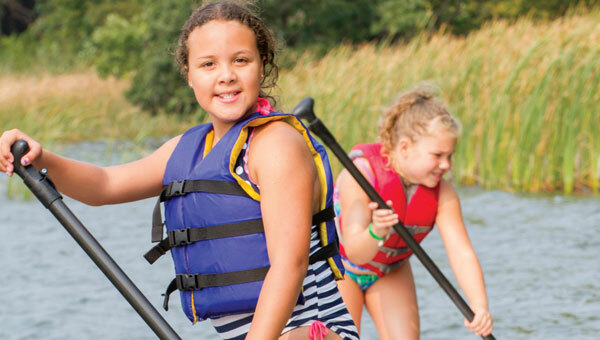 Kids learn basic paddling (forward, turning, stopping), how to stand up on a board, lift and carry their board, and how to launch and land it.